If you've been around this site long enough, you know I am a big fan of TED.com. It's a great site to visit on those days when you lose faith and wonder if there is an intelligent person left in the known universe. I visit there often. Ever wish you could change the world? At the end of each year they announce a special grant recipient, known as the TED Prize. This person gets their "wish" for changing the world granted, or at least the platform to try and launch the improvements. Past winners have included James Nachtway and his photography series about antibiotic-resistant TB, and the Encyclopedia of Life project, and Sylvia Earle's wish for creating protected marine areas. So, what does this have to do with food, Beth? Well, this year's winner is none other than Jamie Oliver. The actual "wish" will be unveiled in February at TED2010, but looking at Oliver's focus these last years, it's a safe bet that the project will center on the obesity epidemic. Notable programs he developed included School Dinners and Feed Me Better, both of which strive for better school lunches and nutrition for kids. 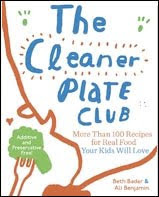 What's notable is the recognition, not just of Jamie Oliver, but of placing the obesity epidemic on the same level of magnitude as the other TED prize issues. True. But if you are beginning to feel some of that holiday guilt creeping in as the scale creeps up from all the parties and events of this month ... well, read on. The Center for Advancement in Cancer Education is urging people to enjoy holiday foods with "informed moderation." According to a report released just last month by the American Institute for Cancer Research, about 100,000 cases of cancer each year are linked to a patient's history of excess body fat. These cancers include liver, kidney, breast, and colon. Almost like a dietary double-whammy, research from the Huntsman Cancer Institute at University of Utah shows that sugars can even "feed" cancer cell growth since cancer cells use a lot more glucose than normal cells. Okay, Scrooge, it's the holidays, what gives with the no sugar thing? Definitely, I know, it is the holidays. But not everyone can indulge, especially those at risk or with a history of diabetes. If you have family with special diet needs, the following recipes will be a welcome sight at your family table. "Don't worry. You can have your proverbial cake and eat it too," says Susan Silberstein, PhD, Executive Director of the Center for Advancement in Cancer Education authored the recipe book "Hungry for Health." Which means a Merry Christmas for ALL, and for all, a little dessert. For more information about "Hungry for Health," or about the scientific data linking diet to cancer prevention and control, contact the Center for Advancement in Cancer Education. Sounds like summer doesn't it? Not bone-cold December. I guess you don't have to wait for the holiday to have a few surprises. One of my favorite local farms is experimenting with high tunnels, which means I am experimenting with FRESH LOCAL salad greens in December. 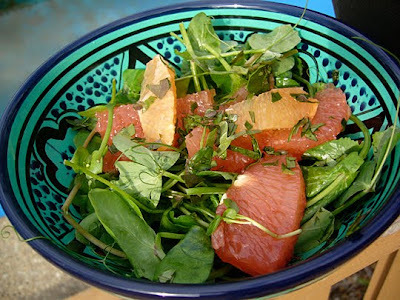 Winter is also peak season for grapefruit and citrus. All the more reason to celebrate. Divide salad ingredients among four plates. Drizzle with dressing. You have room for some cookies now! Thinking Globally. Worldwide issues of climate change and hunger and what that means for all of us, and how we are all connected in these issues. Acting Locally. Ways to be active in my (and your) own community for Food Justice, and helping grow the local food movement for all. Issues, laws and your food. Just not going to get away from this one. Hot buttons ahead; school lunches, food policy as health policy. A little bit of humor now and again. I used to post these things, but we can all use some levity these days. More free books. Well, as long as I have them to share! As far as the other stuff; lose weight! learn a new language! exercise! Hey, we all do what we can. I don't need to wait for the calendar to tick over years before I do something worthwhile. I just need to not let the time pass by before I do. December's winner for The Berghoff Cafe Cookbook is Suburban Prep. Be sure you email your mailing address to farmerfare AT gmail DOT com to get your free book! 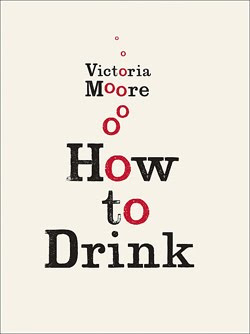 January's giveaway is, appropriately, Victoria Moore's book How to Drink. Leave a comment with your favorite cocktail or adult beverage you celebrate with and you will be entered into a random drawing to win the book. The book covers not just alcoholic beverages, but the perfect seasonal drink for nearly every occasion. Recipes for the perfect drinks and cocktails are accompanied by advice and historical insights into beverage options. Remember, kids, as the author says, it's not how MUCH you drink, it's how WELL you drink. And drive responsibly. Cheers for a happy 2010 for all! I took down quite a few of the recipes on the site for the upcoming book. 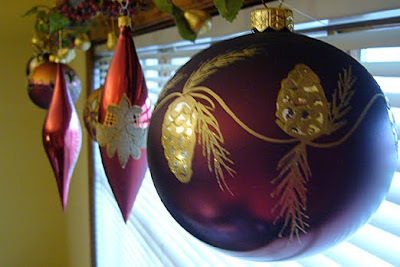 Still, there are many of the holiday favorites to be found. Here's to a warm kitchen, full of family and friends and a safe, happy holiday to all this season. Tired of Tiger Woods? Wanting News that Matters This Holiday? Yep, me too. And all the not-news celebrity drivel out there. Let's look at some headlines that mean something real here. Last Minute Gift Ideas: A Lunchbox! Still looking for that perfect gift for the kids? How about a nice, new lunch box? Think of it as the gift that keeps giving, especially given that the meat at fast food establishments is safer than that being served for school lunch. That's right, according to this USA Today report, your dollar burger from the drive-thru is 5-10 times more likely to have been tested for safety than your elementary school kid's meal. Some fast food establishments also have up to 10 times higher standards for those tests that are done, and refuse to use "spent hen" chicken meat that is often served to our school kids. Makes you want to send some holiday greetings to the USDA? Here, give your best to Mr. Vilsack. According to the U.S. Department of Agriculture’s Economic Research Service released its annual study measuring food security in the United States, Household Food Security in the United States, 2008. Food Insecurity rose 4.2 percent this past year. In 2008, 49.1 million Americans, or 16.4 percent, lived in food insecure households In 2007, the number was 36.2 million (12.2%). This represents a 36 percent increase in just one year. The greatest percentage of this increase was for households with children. Learn more about donating food in this post. Find a place to donate or volunteer here at Feeding America. Pork in a Tube, test tube that is. First lab-grown meat created. Ethicurean contemplates the class issue around Local Food. I got the idea for this recipe at an Italian restaurant, one owned by Lidia Bastianich. 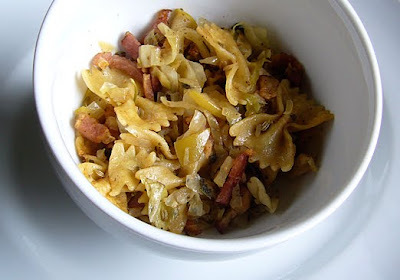 When you think about the ingredients, cabbage and bacon, it doesn't seem very Italian. It also doesn't sound like it would work with pasta. Yet it did, pretty well. I'm not about to suggest that I cook better than the world's most famous Italian grandmother. No way. But the dish got me thinking. Bacon and pasta. And a huge head of cabbage from the last CSA package of the season. A few of the last apples still in the fridge. Hmmm, could work. I'm not going to call the end result Italian or German. It's just a nice, cozy dish on a cold winter day like today. Something warm and spicy while we wait for the winter storm to hopefully pass us by. Cook the bacon in a large pot. Remove when just crisp and drain on a paper towel. Pour off all but 1 tbs. of the grease. Add the shallot to the pot and saute for two minutes. Add the spices and saute for a couple more minutes. Add the apples and cabbage and saute again, tossing to get the cabbage wilted. Cook pasta or gnocchi according to directions. Add the cider, vinegar, sage and rosemary to the pot. Braise the cabbage and apples with the spices and herbs for another 5-8 minutes. Before serving fold in the crisp bacon and the gnocchi or pasta. There are two seasonal foods that I have a real weakness for; pumpkin ice cream and egg nog. Real, full fat, buttery-rich eggnog. Ho, ho, ho, off to jog I go. 6 slices egg bread like challah or brioche, or a whole grain like honey wheat. Heat the butter in a skillet. Soak bread, both sides, in the eggnog mixture. Brown on each side until golden. 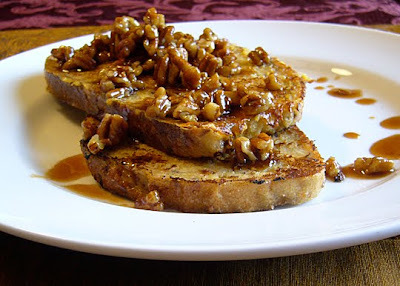 Warm the syrup in a sauce pan with the bourbon, cinnamon, and pecans. 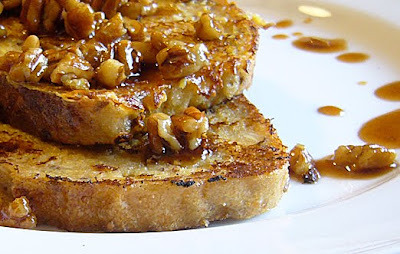 Top the toast with syrup. Enjoy. 20,000 more people per day require food stamp assistance. 239 counties in the United States where at least a quarter of the population receives food stamps. More than 36 million people use food stamp assistance. Nearly 12 percent of Americans receive aid. Something to think about this holiday. 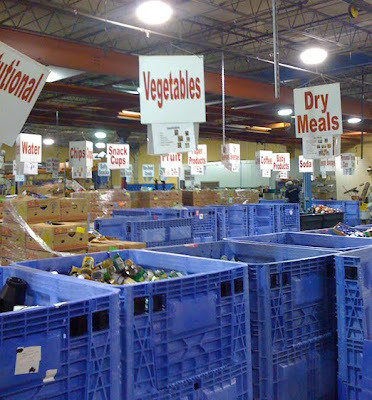 Here's some great tips on donating food and time to a local food bank. Hope everyone had a great Thanksgiving! I am finishing off the last of the sweet potato pie here as I write. Tomorrow, five mile run. And salad. Congrats to November's winner, Mindy, for her copy of The Spice Kitchen. There are a few recipes in there that should come in handy for December. Mindy, please leave your mailing address for me at farmerfare AT gmail DOT com. With winter fast upon us, I find myself craving comfort food often. 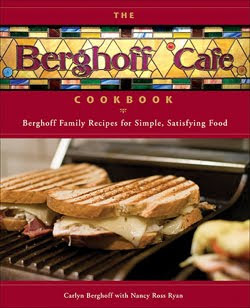 This month's free book is The Berghoff Cafe Cookbook. Book provided by the nice folks at Andrews McMeel Publishing. The book features familiar German foods with a twist, making for some unique recipes such as Brat, Kraut and Onion Pizza with Swiss Cheese and Caraway Crust as well as classics like Lyonnaise Potatoes. What I like about it is that it shows how to use leftovers creatively so you minimize food waste and save money while making family meals. Very practical. Just leave your comment below to be entered into the random drawing. Good luck! I was reviewing my Thanksgiving menu and thought, hey, that's all a lot of heavy food. Maybe a salad would be good here? Thing is, to stand up next to all that goodness on the table, it can't just be any salad. Fortunately, this one can be made ahead and just assembled day of. 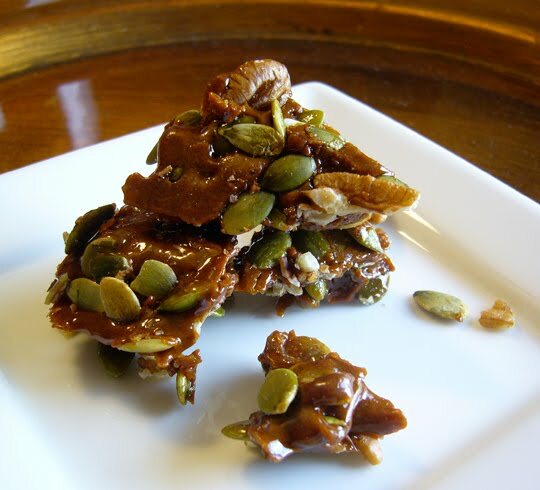 The first step is the brittle. You can eat this plain, too. And you can make it several days ahead — just hide it so you have some for the salads. You'll need a silicon mat positioned on a baking sheet. Spread the pecans and pumpkin seeds out in a thin layer over the silicon mat. Thin is best for the brittle to harden well. Sprinkle the pecans and seeds with the salt. Put the sugar and molasses in a saucepan over medium heat. Only stir enough to prevent burning, otherwise, as the Beatles sing, let it be. When it becomes a deep brown liquid, stir in the spice powder. Then, pour it in a thin layer over the top of the pecans and pumpkin seeds. It should cool rapidly and harden. Carefully break it into pieces (sharp edges!) when it is hard. After poaching, you will need 1/4 cup honey. Poach the pears in the wine for about 20 minutes, or until soft. Remove from the liquid and cool. Halve, core when cooled, then slice each half into four lengthwise. Strain the poaching liquid back into the a saucepan. Add 1/4 cup honey. Return to heat and then reduce this liquid to a syrup consistency. If you are making ahead, store the pear slices in the wine and honey syrup in the refrigerator. Before service, divide the greens among plates, top each with equal amounts of pear slices. Drizzle the syrup on each plate. Top with the gorgonzola and brittle pieces. Just got done playing bumper carts at the grocery store. Wow. I try to get as many local ingredients as I can for Thanksgiving, but there is still a trip to the store involved. And a grocery bill that reads more like a mortgage payment. There is also a slightly obscene feeling to buying two pints of heavy cream and eight sticks of butter for one meal. Thanksgiving is that annual time of year to pay homage to butterfat. It is also the time of year when I make more lists than Santa Claus. First list Menu, next list, Grocery store, check. Grocery store and local produce sources both for that list. I have just enough OCD that I even organize this list by aisle at the store. Basically, its what we are all doing right this moment. Well, that and cleaning house and wondering, "How am I going to get all this done?" Clean out the fridge to make as much space as possible for the incoming. Put all your recipes together and scan them, compiling the amounts of the same items into one list, so three recipes call for 1/2 cup of cream means you need add pint to list. A great tip on recipes is to think about making items that require the same oven temperature for your sides, or don't require the oven. Makes life SO much easier. Check your pantry against the list, crossing off what you have. It's cheaper to use what you have on hand — just make sure you have enough! Remember the bulk aisle to save money on the nuts and other items. Don't forget the items you need to make the leftovers into soup or casserole. Next steps for me now are to make a few more lists. Chop list, list all the quantities of produce you need prepped and measured into one list. You can do this work a day ahead, even two days for some items. Plus, the prepped items take far less space in the fridge — leaving room for the turkey. Errand list, things for us like pick up the turkey from the farm (already butchered, thankfully), liquor store, and items that need to be purchased day before like fresh bread or ice. House list, vacuum, set table, anything on the to-do's that can be divided and conquered. Share the wealth, I say! Last on the list, is the Timing List. This is the one where I write down all the items that need to be done day before and day of, and put them in order of timing. It's easy to get sidetracked and forget. Doing this one list in advance is mandatory for making it to the table on time. This list will keep you sane. Now, I better go work on those lists! I promised Ruthy I would post this recipe. Brussels sprouts are in season right now and if you never liked them before, (and I was right there with you), you should try them again. Plus, they are just a crazy looking vegetable on the stalk, like a club you can eat. I use nitrate-free bacon and recommend you do as well. You can reduce the amount of bacon used here, use prosciutto, or skip it if you do not eat meat. Preheat the oven to 375 degrees F, roast setting, if you have convection oven, or 400 degrees for a regular oven. 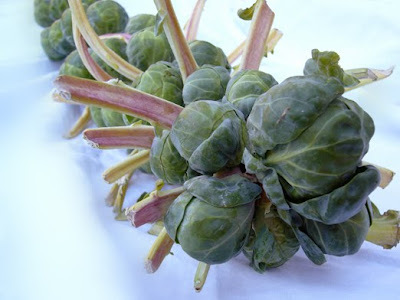 Toss the sprouts with olive oil and coarse sea salt. Place in a single layer on a baking sheet. Roast for about 15-20 minutes until they start to show some golden brown. Go for lots of golden brown, you may have to stir once during roasting. Remove from oven and place on a platter. While the sprouts are getting crispy, cook the bacon in a skillet until almost done. Pour off all but one tbs. of the grease. Add the shallot and finish cooking the bacon and shallot until browned and done. Remove from stove, whisk in olive oil and red vinegar, honey and Dijon. Salt and pepper to taste. Drizzle the dressing over the sprouts. Top with the shavings of Pecorino. If you have not read this article in the New York Times about commercially raised and slaughtered beef, you need to. Thank you, Costco, for testing your beef independent of the suppliers — even when suppliers like Tyson will no longer sell to you because you care about your customers. And, Cargill, what's with treating meat with ammonia during processing, and still having it contaminated? Not just with E. coli now, but ammonia, too? This meat was used for school lunches. Your meat patties were also the source of the E. coli that sickened the article subject. Favorite quote in the article, Dr. Kenneth Peterson on why the department could mandate testing, but that it needed to consider the impact on companies as well as consumers. “I have to look at the entire industry, not just what is best for public health,” Dr. Petersen said. Dr. Kenneth Petersen, is an assistant administrator with the USDA's Food Safety and Inspection Service. I see FOOD SAFETY in his title which kind of means public health, right? I did not see, CORPORATE PROFITS AND BEST INTEREST in his title. The man is a doctor. Did he take the hippocratic oath or the hypocritic oath? Wow. I quit posting as much on these issues because I got overwhelmed by it. But, when I read things like this, I can't not post on it. We consumers need to know. If our own government agencies won't protect our interests over corporate interests, then maybe its time for justifiable lawsuits directly against these companies by the consumers who have been sickened. This needs to end. First, congratulations to GiGi as the random drawing winner of October's book, Vegan Lunch Box Around the World. GiGi, please give me some directions on where to mail your book at farmerfare (at) gmail (dot) com. Just as stores everywhere are cramming the shelves full of red and green, here is a warm, earthy book perfect for fall and Thanksgiving. 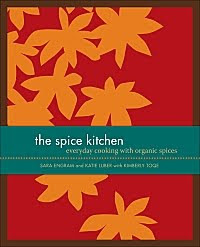 the spice kitchen, everyday cooking with organic spices by Katie Luber and Sara Engram is 192 pages, hardcover and full color, and a new release provided to me for review by publisher Andrews McMeel. I'll be posting the review at Eat Drink Better this month. For those of you who read this blog, you know how much I love spices, so I can't wait to share this one with you. You can leave a comment to get your name in the drawing to be the lucky winner of this book. Just my way of saying "THANKS" in time for Thanksgiving. I'll post the winner's name at the beginning of December and announce the book for giveaway that month as well. Wash pumpkin. Cut it into halves and scoop out the seeds and stringy pulp. 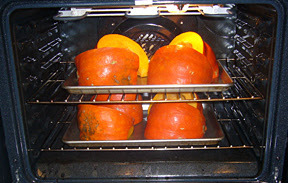 Spray a baking pan with nonstick as well as the cut sides of the pumpkin. Place the pumpkin on the tray cut side down and cook for about 90 minutes, until flesh is fork tender. Remove from oven and allow to cool enough to handle. Scoop flesh from the skin. Heat olive oil in a large Dutch oven or stock pot. Sweat the onions and garlic until onion is translucent. The difference between a sweat and a brown is the stove temperature. Sweating is a medium-low temp that gets your onions and garlic (aromatics) to give up their moisture and flavor easily. You do not brown the veggies when you sweat them. Browning takes a medium-high temperature. Add the curry powder, red pepper flakes and ginger and stir for half a minute to get the curry going. Add stock and heat to a boil. Add the pumpkin then reduce heat to a simmer. Simmer for about 20 minutes. Use a stick blender to puree the soup. 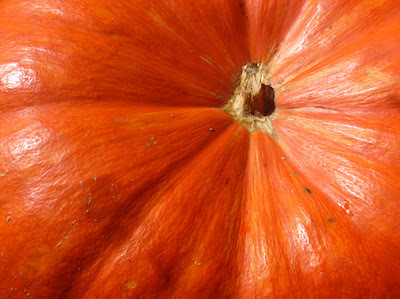 This type of pumpkin is very stringy, but it will blend easily. Add the sugar and the coconut milk and heat through. Season to taste with the salt. If desired, garnish with cilantro. This soup tastes better the second day when the flavors have blended more. There has been a lot of news lately about the pumpkin shortage. Good news is, not all states are affected. 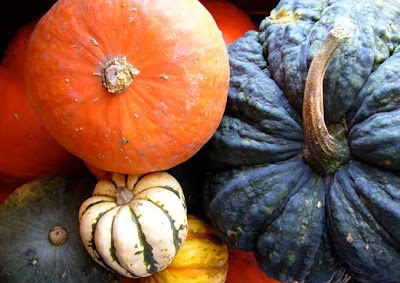 More good news is that many of the "decorative" pumpkins you see are actually delicious, edible pumpkins in disguise. Have no fear this October should you reach for a can of pumpkin and the shelf is bare. It's easy to make your own puree. First, get a large pumpkin. Not the jack-o-lantern kind. Or get a few small sugar (pie) pumpkins. I used a "Cinderella" variety. It is large, flattened and a beautiful deep red-orange. The flesh is thick and has a high water content. So, the pumpkin is heavy for it's size. This one weighed in at 16 pounds. 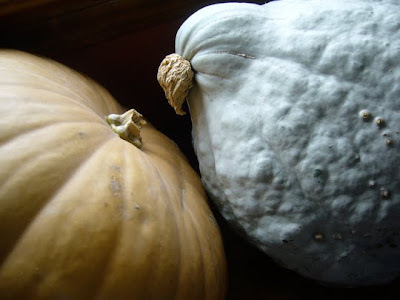 Other heirloom varieties that are supposed to be good for puree are Musquee de Provence (Fairytale), Long Island Cheese and Hubbard Squash. Roughly, you can figure on about 6-8 cups of puree for a 16 pounder, 4 cups for an 8-pounder, etc. The first step is to be sure you wash the pumpkin. 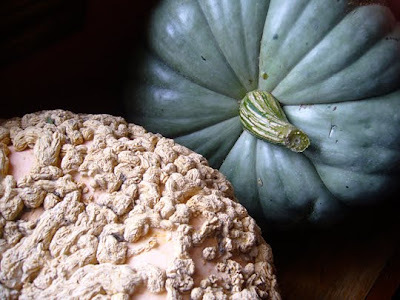 Now, cut pumpkin in half and remove seeds and pulpy part. You don't have to peel it! Spray a baking pan with cooking spray and spray the cut sides of the pumpkin as well. Place pumpkin, cut side down, in pan. Bake until the flesh is soft, about ninety minutes. Remove from oven and let cool. Be sure you do not leave the cooked pumpkin out for more than two hours. Got to remember that food safety! After it has cooled, scoop the flesh from the skin and blend flesh in a food processor. Now, fresh pumpkin is going to be much more watery than the canned kind. 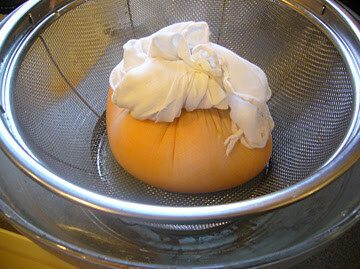 So, you will need to line a strainer with cheese cloth and place the puree on top of this. I make a little bundle to help "press" out the liquid. Set the puree and strainer both into a larger and deeper bowl. Cover with wrap and place in the fridge overnight to drain. I saw an article on how to "save" your jack-o-lantern and make puree with it after Halloween. This is not a good idea. Think about it. How often do you take produce out of your fridge, cut it open, set it on the front porch for a week, share a bit with the neighborhood squirrels, burn a candle in it, then take it in to cook? The cut flesh that gets exposed to air collects a fair bit of bacteria while you are handing out all that candy. 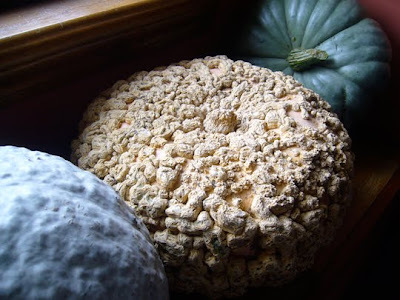 Additionally, this is not the best tasting pumpkin since it is cultivated for size and carving, not eating. Especially after it's been outside for a bit. Compost that sucker. 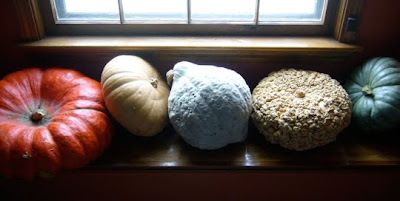 Here are a few more pumpkins sold as decorative that are actually edible — and delicious. We're coming up on the holiday season, the time of year when most of us probably do all of our charitable giving. In November, food donations are especially frequent as we all prepare to sit around our own tables and give thanks for plenty. Recently, I spent the day (along with all my co-workers) volunteering at Harvesters, one of our nation's largest food banks. 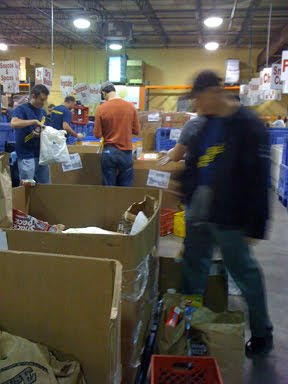 My main job was to sort those very food donations that each of you generously provides. I learned quite a bit from the experience, so I wanted to pass along some of those observations about the food donation process. What is a food bank or network versus a food pantry? A food bank is a large warehouse facility that has tremendous purchasing power, then in turn, fills the shelves of local food pantries and organizations at little to no cost. Food banks handle donations from individuals as well as corporate and manufacturer donations, makes bulk purchases direct from manufacturers. Food banks also handle fresh bread and produce donations, many of which can move those donations quick enough to be able to leverage most of these perishable items in a day. It's a pretty amazing operation. Food networks are the combined power of food banks working as a group. How many people require food assistance? I don't have numbers for nationwide, but for Harvesters, in the 26 counties they serve, they feed over SIXTY THOUSAND people per week. This 60K people includes 550 nonprofit agencies; such as emergency food pantries, soup kitchens, homeless shelters, children’s homes, homes for the mentally disabled and shelters for battered persons. With the economic challenges, the demand has risen by 40 percent and continues to increase. What happens to my food donations? 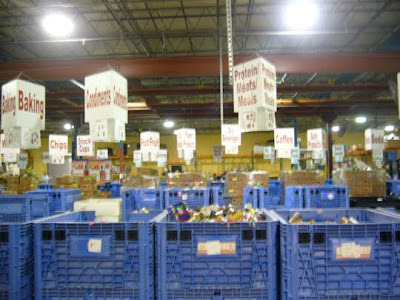 Once the donations are gathered, they go into large bins on a sorting floor. 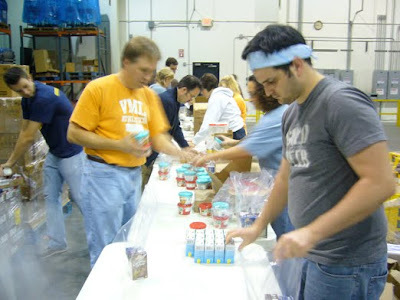 Volunteers and staff sort each and every item by hand into different food categories such as beverages, vegetables, meats and proteins, baking goods, and even baby items. Here is a behind-the-scenes look that might help you understand the donation process and maximize your gifts. Each item that comes in a glass container has to be individually washed and placed in a separate bin to avoid risk of injury or breakage. Hint: Avoid donating glass containers. 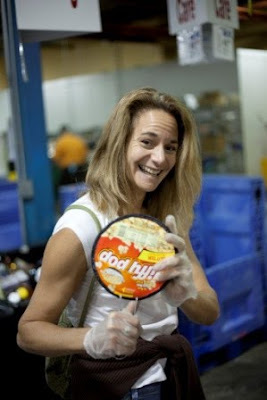 Canned good are inspected for dents and damage. Some damage is unavoidable just in handling, but each dented can has to be reviewed and determined to be safe or not based on the condition of the can, size and location of the dent. When in doubt, it gets tossed. Hint: Avoid donating dented goods. Once sorted, similar items, 24 different cans of green beans for example, must all be re-packaged as a group, even if they are not the same brand. This allows the items to be shipped to the agencies that need them in bulk quantities. Hint: The easiest donations for sorting and volunteer time are items purchased at a big box store like Costco and left in their bulk packaging. Even with additional time to sort these items, they have great value. Ethnic foods are very welcome, especially for food recipients of that culture. Unique items also help add variety and even premium quality to the food mix. 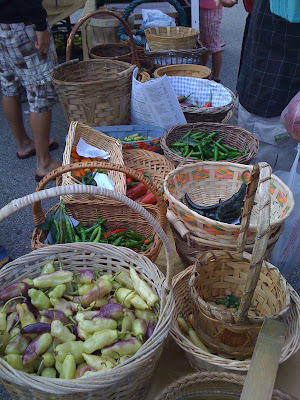 I was pretty happy to see a lot of great organic items and a good mix of ethnic ingredients. Hint: It's a great idea to be inclusive of culture and quality food options with donations. To keep the sorting a bit interesting, we all were on the lookout for the most obscure items. We were also advised to look for any kind of label that we knew was dated. Canned good items must be within a few years of expiration date. Preferably, they should not be expired. We found such exotics as a 1970s can of smoked oysters (that would be, like, lethal to eat! ), a vintage box of gelatin, a glass jar of Borscht so old it was brown, and some Jiffy Pop in its pre-microwave stovetop form. Ancient instant coffee (old AND instant? That's just doubly cruel). Hint: If the item has been in the back of your pantry so long that it would cause bodily harm to consume, don't donate it. Especially baby foods and formula. We also found random items like a box of drink mix, opened, with only one envelope in it, partially consumed items, a few miscellaneous tea bags in a plastic baggie. All of this refuse from folks' pantry clean outs has to be discarded. Why not do it yourself instead of wasting volunteer time? Hint: I did not enjoy cleaning out your pantry for you. Household goods, (think if you had to choose between food and toilet paper because you can't afford both), are also needed. Baby items like wipes and diapers. Quality, non-glass containers of NON-expired baby foods and cereals, formula are also highly valued donations. The Harvesters site has a lot of great ideas about how to organize your own food donations, or have a party with friends to come volunteer together before you go have a drink, host a holiday dinner party and charge an "entry fee" of a food donation. 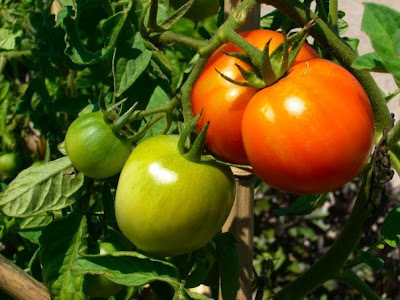 You can even donate fresh produce from your own garden if you have a green thumb! Really, there are a lot of great ways to give. 1970s smoked oysters are just not one of them. Lately, I have been blessed with a massive stack of food books to review. It's taking me some time, especially with our own manuscript due very soon. But, I will be getting to that stack. The only problem — besides needing another couple hours in a day — is that I have run out of shelf space. So, I've decided to share the wealth with all of you. Starting November, there will be one book of the month prize awarded to a randomly drawn name from all the NON-SPAM comments that are left on the book post for the month. I'll post the lucky winner each month and the title of the next giveaway. 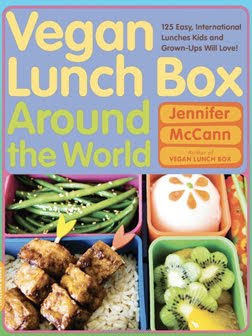 November's book is Vegan Lunch Box Around the World by Jennifer McCann. So, leave a legitimate comment on each month's giveaway announcement (like this post), then check back at the end of November to see if you won! I'll post how to contact me with an address where to send your FREE book. I was crushed recently with the news that Gourmet is no more. It's been depressing to watch the passing of newspapers and now, likely, the single best food magazine. Worse, for me personally, has been watching my own local newspaper minimize its James Beard Award winning food section. 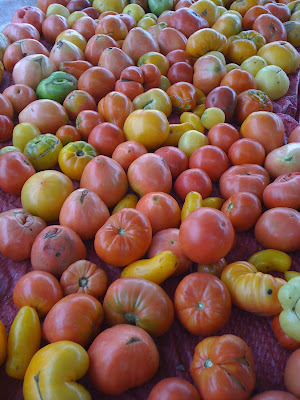 It begs the question, who will be the source of writing on seasonal, local, ethical eating and cooking? 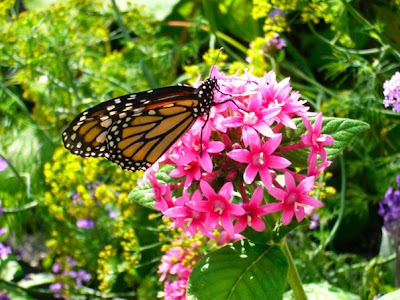 There are a few bright spots online such as Ethicurean. Sources that play at the national level across issues. But what about my local foodshed? I would have to guess that some of that local content will be filled in by bloggers. People like me. Thing is, as hard as I try, I can't replace a full time staff of journalists. I do adhere to standards of good research, fact checking and journalistic ethics. But, not all bloggers have that background. Courtesy of Andrews McMeel Publishing, I will be attending the following event here in our KC area. Spots are still available! Here's the thing. If I did not want to attend the event, I would not have accepted the offer of the ticket. Besh appears to be one of the chefs that actually walks the walk on local sourcing. I want to find out in person. I want to taste the food. I'll let you know how it goes. If you aren't already going, too. It's already getting cool, a few golden leaves showing and the school buses are back on the road. 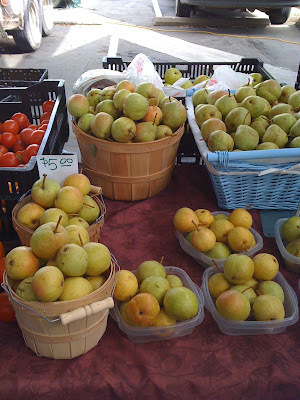 Summer has faded, and the last bit of its bounty can still be found at the market. 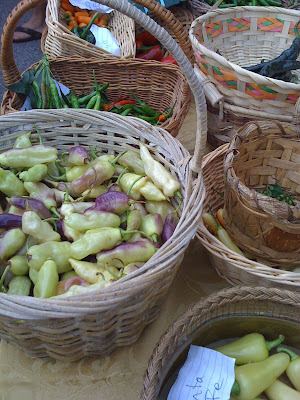 Tomatoes, tomatillos, peppers of all shapes, colors and heat. It's a good time to grab that last bit of sunshine and make fresh salsa. Easy as well. Place veggies on a baking sheet. Toss with oil, spread to one layer. Roast in oven for about 10-15 minutes, or until you get some golden edges, but not burnt. Allow to cool, blend in food processor, just pulsing until roughly chopped. Add cilantro, pulse a few more times. Add salt to taste, pulse to blend. Enjoy with chips. I had this dish in a tapas restaurant in Chicago and made a note to try it at home. Usually, I prefer thick-cut bacon, local, from heritage pork. If you can find something of that caliber sliced extra thin, this is really good. If you can't, the applewood-smoked nitrate-free variety works well. Now, if you are "unlucky" enough to only be able to get the thick-cut good stuff, just do a single wrap on the dates. It won't be as pretty (see photo) but it tastes so good, no one will care. 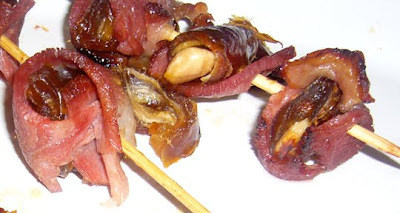 Cut each bacon slice in half, horizontally, set aside with skewers. Slice each date length-wise and remove the seed. Tuck one almond inside each half date. Fold the date around the almond. Repeat with all of the dates and almonds. Next wrap half a bacon slice around a date bundle width-wise. Repeat with the other half bacon slice vertically. Slide the skewer through to hold the little bundle together. Repeat, placing three bacon-date bundles on each skewer. Place the skewers on a baking sheet. Bake in oven for about 25 minutes, or until bacon is crisp. While the bacon bundles are baking (say that fast three times) melt the butter in a saucepan over medium heat. Add the flour and whisk to make a blond roux. Cook for about two minutes. Slowly add the milk while whisking. The sauce should thicken well. Add the bleu cheese in crumbles, whisking as you go, until you get a thick sauce. Taste and adjust with salt and pepper. Serve the skewers with the bleu cheese sauce on the side. I love this month. Not because I am a Virgo. Believe me, after the fourth decade ticks over, you find other things to celebrate that are more fun. 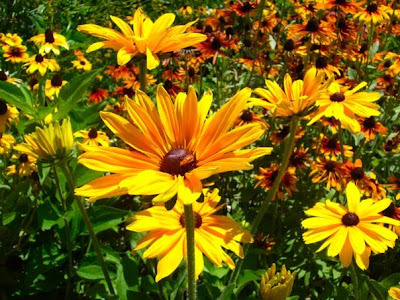 September is just magic. The last of summer's bounty of tomatoes, corn, peppers and stone fruit mingles with the first of fall's pears, apples and pumpkins. The second burst of greens and lettuces are available. You just can't not eat well this month. Happy Friday! Sugar High Friday, that is. This month's SHF has a bit of a twist, Vegetable Surprise! All entries are a dessert that leverages vegetables in the ingredients. I was impressed with the creativity and some of the Indian desserts that were posted. What a great way to get that extra serving of vegetables in your day! 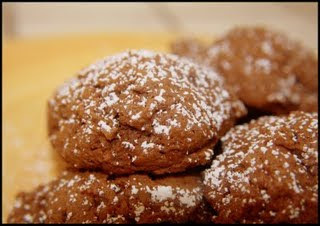 Anna from Life's Too Short For Mediocre Chocolate posted Double Chocolate Pumpkin Cookies! She describes the dish as "Soft, chocolatey, and a little spicy with a kick of cinnamon. Perfect for Fall's hot chocolate nights." 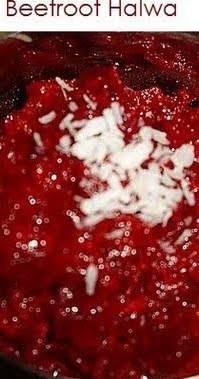 Rinku from Cooking in Westchester shares Beetroot Halwa. This halwa, a type of pudding, is prepared by simmering beets in milk, cardamom and sugar with a glossy finish of clarified butter. Halwa was a popular approach for this month's theme. Ramki posted several different types of Halwa for other vegetables at her site, One Page Cookbooks. Recipes include Carrot, Bottle Gourd, Chayote, and fruit-based Halwa. Just wanted to say "Thanks!" for the recent coverage of the blog. 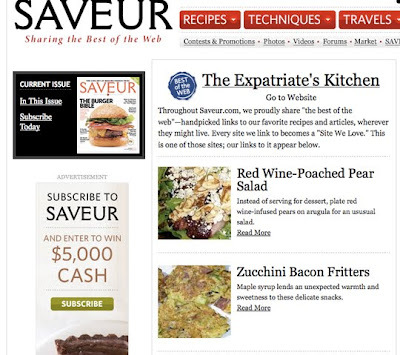 And also to Saveur magazine for the nice surprise I got today seeing links to this site under the "Sites We Love" section there. Very cool. Over at my other online gig, I just finished an interview with Chef Preeti Mystri who will appear on Season Six of Top Chef tonight. Check that out if you get a moment. This month I am happy to host the SHF August 2009, with the theme of "Vegetable Surprise!" That's right, put your best "Iron Chef" on and get crazy with the dessert course — use of ice cream maker allowed. 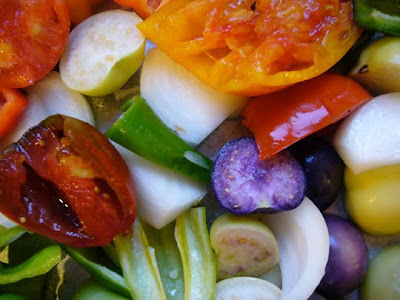 C'mon make us WANT to eat those veggies whether you make it deceptively delicious or just darn delectable, bring it on! Image no larger than 200 pixels wide (height can vary). 3. The deadline for sending in your entries is Monday, August 24, 2009. Maximum of TWO (2) entries per blog. 4. The roundup will be posted on the last Friday of August (the 28th), so come back and make sure your entry is a part of the mega-roundup. 5. 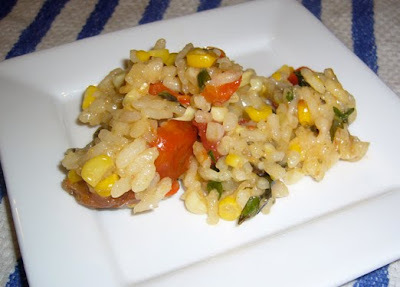 Non-Bloggers are welcome to email me their recipes, and I'll surely include them in the roundup as well. Or leave your recipe in the comments section of the final roundup post. This is perfect as a light summer meal with a salad and fresh melon on the side. To get the kernels off the corn, hold the cob vertical, place the knife along the side and cut down. Turn the cob and repeat. Do this over the tray or bowl. 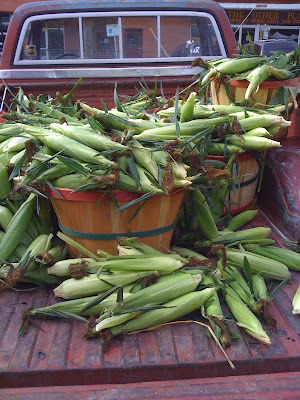 You'll want to keep all the sweet milk the corn releases when you cut. Mix the vegetables on a baking sheet with the canola oil. Roast in the oven for about 15 minutes, stirring if needed, until they just begin to turn golden. Remove from oven and set aside. Bring the water and stock to a gentle simmer in one pot. In another pot, heat the oil and add the rice. Saute the rice in the olive oil for a couple minutes until the grains are translucent. Add the hot stock a ladle at a time. Stir until the rice absorbs the stock, then add the next ladle. Finish with the wine. When all the liquid has been absorbed, the risotto should be al dente and ready. Gently fold in the vegetables, herbs and parmesan. It was an 80-degree Sunday with a cool wind. Perfect weather, and rare for late July. We needed to get outside. 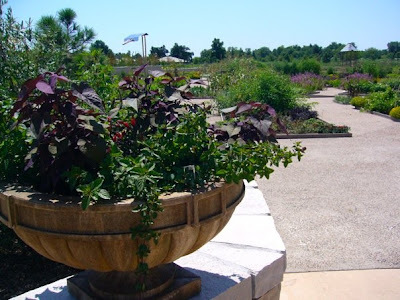 Not too far away, Powell Gardens just opened twelve acres of food gardens, the nation's largest edible landscape. 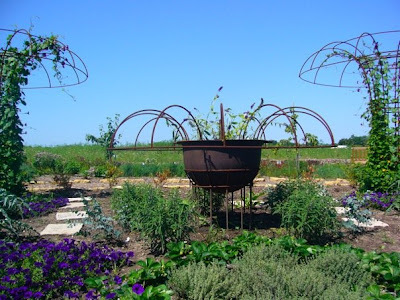 Beyond the typical row crop, the garden artistically mixes vegetables, fruits and herbs in a beautiful landscape. At the edge, a cafe serves food made from picked-that-day produce. After an inspiring walk, where I actually believe for a moment I can overcome my gardening dysfunction, we ate then walked the rest of the gardens, acres of flowers and waterfalls and a glass chapel. Sometimes, you don't have to go far from home to feel like you are on vacation. Think About It Or Not? I think about food. A lot. Some would say obsessively. I can live with that. It's not always, "What should I have for lunch?" Nor is it what recipe to create next. I also think a lot about food policy. Which is not what most people contemplate. Yet perhaps we should. No need to rehash all the recalls and headlines here, it's pretty clear that the industrial food business is not doing a good job of producing safe foods, with some knowingly shipping tainted goods as with the recent peanut product issue. Not a shock that the House recently passed one of the many proposed food safety bills, HR 2749. I mean, what Rep is going to vote no for safer food and have that on his or her voting record? The problem is nothing is ever as easy as it sounds. Food safety is needed. Indeed, just the provision in the bill that allows the FDA to make food recalls mandatory instead of voluntary was a huge improvement. The problem with the bill is that it treats all food production as if it were large-scale industry. And, key provisions such as the $500 annual fee per facility are going to weigh heavily on small, local food producers such as the family that makes and sells jams and preserves at the farmers market. Along with additional paperwork and administrative burdens, the bill is going to put additional pressure on these small local producers who are not part of the problem. Meanwhile, key parts of the bill that would regulate antibiotic overuse in factory farms — a practice linked to the development of MRSA and the virulent salmonella and E. coli strains — were successfully lobbied against and removed from the bill. Another problem in the bill is the impact it could have on wildlife diversity around farms and the burden of compliance with this on small farms. While leaving the major source of food-borne pathogens and recalls out of the picture (feedlots and factory farms) this provision would require farms to clearcut vegetation around cropland, leaving the area open to erosion and a loss of habitat and biodiversity. The good news is that the bill is not yet law. There is time to ask your Senators to keep the good part of the bill, put back the provisions that would better regulate factory farms, and decrease the impact the legislation would have on small farmers. You can find your senator's contact information here. Read a great analysis of the best and worst of HR 2749 here. What's on TV. I mean, is it worth it? Since having a child, I seem to be constantly sticky. I quit thinking about the cause of this. Why my kid will or won't eat this or that. There is no logic. Fix decent food, kids won't starve themselves. Eventually, I'll win. My child's wardrobe. Hey, I am just happy she dresses herself. My wardrobe. I know, it shows. I am just happy I still dress myself. My age. What's the alternative to getting older? Death. Accept aging. All the to-do lists I wrote and lost. I am sure there will be more new items to fill a list. A lot more. Celebrity gossip. Really, why do we care? Lately, it's been a bit of a struggle at dinner time. No, not over food. Manners. Seems like more than the kiddo can bear to remain seated, use a fork she's been using well for years, and just focus. Hmmm. I can recall my own struggles. They ended with a solid thump of a spoon to the middle of my forehead. A firm tap, dealt out by my dad, who had the longest arms of any human ever known. 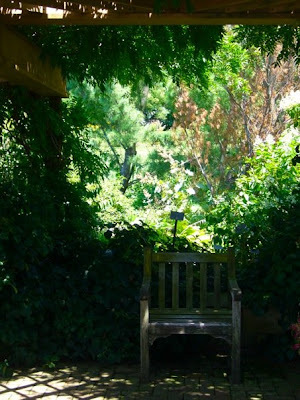 Or at least it felt that way from the farthest end of the table or the corner of the back seat. Temporary attention span issues aside, let's think about this for a moment. Maybe dinner should be fun. Food should be fun. Like legos. Maybe not molecular gastronomy smoking and levitating over the plate, but just add a little something to the topography once in a awhile. So, I played. Basically, this is just grilled vegetables with some spreads and polenta. Yes, I used polenta in the tube. I've not gone all "semi-homemade" on you guys. The only addition to the polenta in the tube is water. It's not ready to go, unless you slice it into circles and bake it. Which works really well. 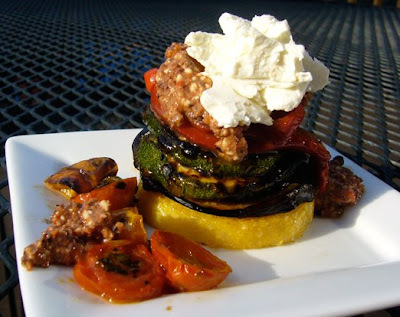 The rest is just stacking up grilled veggies and using pesto for spackle. Don't heat up the grill and oven both just for this one. Wait til you were going to throw something on the grill anyway. Prepare all the pesto and spreads. Oil, salt and pepper the vegetables for the grill. Now, you can buy the pesto and the olive spread (not that it's better, but you can). Other time saving steps — well, my husband does all the grilling. That helps a lot! Grill these just a few minutes a side on a medium-hot grill. The grill marks are nice to have. Preheat oven broiler on low. Spray a baking sheet with cooking spray. Place rounds on the sheet. Broil for a few minutes until golden brown. Assemble the stacks in this order polenta, 1 tsp. basil pesto, 1 slice zucchini, 1 tsp. olive tapendade, 1 slice eggplant, top with a few red pepper strips and some of the roasted tomatoes, then a tablespoon of the goat cheese. Repeat with the other rounds and veggies. If you are making this in a larger quantity, doubling for a party even, you can keep these warm in the oven before serving. Put the garlic in the food processor first, then the nuts and red peppers, olives last. Try to keep some of the texture, not just puree, to use the pulse method instead of just turning it on. This dip is amazing with pita chips and bruscetta or a antipasta platter as well. "Pitted" kalamatas are not always all pitted, so for the benefit of your food processor (trust me on this one) check the olives for pits as you put them in. Toss tomatoes, olive oil, garlic, crushed red pepper and marjoram in large bowl. Place tomatoes in single layer on baking sheet. Sprinkle generously with salt and pepper. Roast until tomatoes are blistered, about 35 minutes. Top with chopped basil. These work well in other recipes, but also make a delicious and easy pasta dish when tossed with cooked pasta and a bit of grated parmesan. Wow. Is it just me, or does the little dude look completely deranged and possessed? 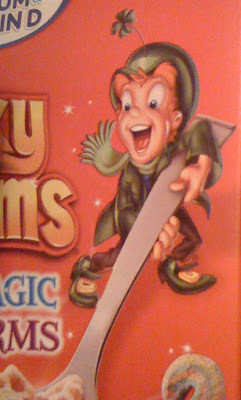 He should really seek some professional help to get down off that sugar high that requires a giant spoon. Here's what we do for cereal. We buy the great big boxes of plain oat cereal or some organic brand from a big box store or bulk bin. Then, store the cereal in bins, without the labels. Cereal is just cereal. No licensed characters waiting to lure my child into a sugar frenzy. Because it is just cereal we're buying. Lately, I have been exploring homemade frozen fruit bar recipes. It's ridiculously easy, and yet the kiddo is totally impressed that Mommy can make popsicles. I guess it's the simple things in life. As long as she keeps eating eggplant and squash disguised as lasagne, I am happy to hand her a "dessert" with two servings of fruit packed into it. She doesn't have to know all this is healthy. 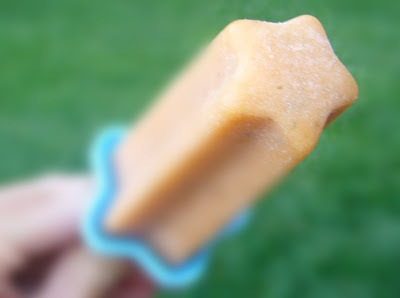 The first round of popsicles I made were peach, honey and herb. Really good. But have to save that one for the book project. The other one was a bit more creative. Put all but the cilantro in the blender and blend until smooth. Fold in the cilantro (to keep the popsicle from ending up greenish). Pour into six popsicle molds and freeze at least two hours. Just before the last bit where you pour the mix into molds, I was very tempted to dump in some ice and about six ounces of rum. It's been that kind of few weeks, kids. And it still sounds good. So, there's another approach. Note that the rum will prevent your mix from freezing into actual popsicles, in case you were thinking about that. Whichever way you choose to make this, enjoy!